You don’t need a history degree to know that the Ancient Egyptians were firm believers in immortality. It’s this belief that Pharaohs who died would be reborn and become immortal which was the reason they were buried with all their treasures alongside them inside their tombs in the heart of pyramids and now you can explore them to claim the riches all for yourself! Pyramid: Quest for Immortality by Net Entertainment (NetEnt) is yet another Ancient Egypt themed slot that they have produced, with other popular releases from the period like Egyptian Heroes and Secrets of Horus proving to be extremely popular amongst players too, and we are in no doubt that you’ll love exploring these pyramids! The Ancient Gods of Light and Darkness, Horus and Anubis, guard the riches of this pyramid as you pay it a visit late at night while clusters of stars brightly twinkle in the sky. The pyramid consists of 5 reels but instead of having three or four rows of symbols across the board like we so often see, these reels have a 3x4x5x4x3 structure instead which is a welcome change. Boasting 720 ways to win, you will have to pay a minimum of 10p up to a high limit of £200 to access this pyramid as you go in search of unlocking the secrets of immortality. You’ll be richly rewarded for your efforts as there are rewards of up to 3,600,000 coins available – achievable thanks to Wild Ankhs, an incredible Avalanche Multiplier feature and Wild Generations! As you’d expect from an online slot powered with software NetEnt, this free Pyramid: Quest for Immortality slots game boasts an incredible design with golden statues of Horus and Anubis sticking out from above the first and fifth reels respectively. Let’s just hope they take a shine to you and allow you to make a quick exit with all the late Pharaoh’s treasures! Ankhs were a symbol of life in Ancient Egypt and they have great powers on these reels too as they act as the Wild symbol and have special Generation capabilities which we will discuss further down. Locating the Pharaoh can see you rewarded with up to 50 coins, finding his mistress will see you pocket up to 25 coins, there are up to 10 coins on offer for discovering scarab beetles and golden eagles, golden snakes are worth up to 8 coins, while there are also Ace to 10 symbols which have been designed as hieroglyphics on papyrus paper. 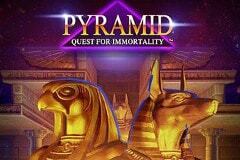 The Pyramid: Quest for Immortality video slot might not be packed full of bonus features and many of you will be disappointed to learn that there is no free spins mode, however it makes use of Avalanche technology which many of you should remember from the Gonzo’s Quest slot machine – one of NetEnt’s most popular releases. This means that the symbols all fall into place automatically when you click the spin button rather than you witnessing the reels spinning which I found leads to many more spins per minute – great for those of you who like fast-paced action. It also means that whenever you land winning combinations, the symbols which contribute to that win will explode and disappear before being replaced by new ones and this continues until no more winning combinations are created. For every three consecutive Avalanches, you will notice that the multiplier bonus will increase up to a maximum of 10x which highlights the incredible wins that are achievable here. Finally, the Wild Ankhs also have significance here as three of the highest-paying symbols on the pay table have blue backgrounds during the Avalanche feature and if these are part of winning combinations, the Wild Generations feature kicks into action to make those positions Wild for the next spin. Many of you may have laughed at the Ancient Egyptians believing in immortality, however after spinning these reels you will become a believer too. Despite lacking a free spins feature, the Pyramid: Quest for Immortality slot boasts a stunning design with two of the most famous Ancient Gods watching over the reels, an enchanting soundtrack keeps you immersed in the theme as you explore the pyramids, plus the sensational Avalanche and Wild Generation features rarely see you leave the pyramids without lots of valuable treasure!